Our product range includes a wide range of aquaproof wallcare premium putty, aquaproof wallcare classic putty, aqua plast acrylic premium putty, aqua plast acrylic classic putty, redi plast exterior & interior and bond-a-block. Aquaproof Wall Care Premium is one of India’s top class velvet finish permix white cement based & Polymer modified putty manufactured by experts in the filed. It is white cement-based putty in a powder form. It is easy to apply and very economical too. Aquaproof wall care premium is to be applied before painting on the plastered wall/ceiling to level the surface. It gives a smooth finish and an excellent water-resistantfinishing. Aquaproof Wall Care Premium is No water curing required. 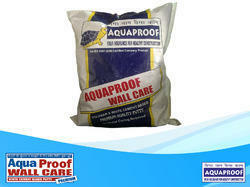 Aquaproof Wall Care Premium is durable and imparts excellent water resistant and waterproofing properties. Aquaproof Wall Care Premium Can be applied on new as well as old surface as it poses excellent bonding properties. thickness per coat thus small holes; crevices can be leveled but maximum two coats only. Aquaproof Wall Care Premium has excellent scratch resistance and mark resistance. Aquaproof Wall Care Premium can be applied on concrete, cement plastered surface. 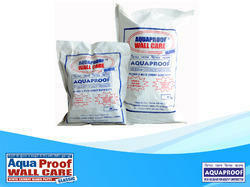 Aquaproof Wall Care Premium give more coverage hence it is economical. 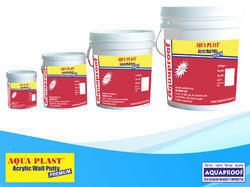 Aquaproof Aquaplast Premium ready to use water based acrylic wall putty for interiors in the paste form. It is one of the best products of its kind available in market provides a very strong and durable finish. Aquaplast Premium has excellent adhesion to the surface and provides quality walls and ceilings for residential or commercial constructions. It has special acrylic binders that ensure that it retains a strong grip on the wall surface. It is also enhances breathability and lesser porosity compared to conventional putty. Aquaplast Premium has superior workability, ensures ease of application for fast work execution. It has better alkali resistance, thus making it more suitable for new walls. Aquaplast Premium can be applied on almost all interior surfaces new or old. It is quick drying, thus ensuring faster completion of jobs. 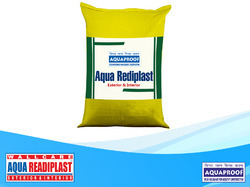 AQUA READIPLAST EXTERIOR & INTERIOR is a factory made preblended sand-cement plaster with polymers supplied in dry form. It can enable a significant increase on construction productivity as well as a substantial enhancement on building quality. Reduced shrinkage cracks through better cement hydration. Easy to mix and apply Better finish and surface appearance. Almost nil wastage of material at the site. Reduction in material lifting cost. 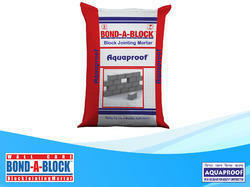 Bond-A-Block(B-A-B) is a versatile thin jointing material for laying AAC blocks, fly ash bricks, concrete blocks etc. Bond-A-block is specially designed to provide stronger, much more durable bonding between the blocks and superior adhesive strength. It replaces conventional cement and sand mix mortar. No water curing is required after application. Easy to mix. Much faster to apply due to its superior flow-ability and water retention properties. Thinner jointing material with very high adhesive strength improves overal masonry strength and bearing capacity. Raking of joints is not required before plastering. Ready for plastering just after 24 hours. Eliminates lengthy process of site mixing, transport and storage of all individual materials. Raw materials are processed, reducing the chances of efflorescence. (B-A-B) jointing agent is made from Eco- friendly materials. 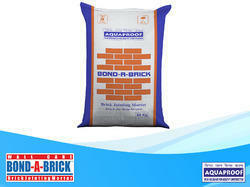 Bond-A-Brick is a cementitious, durable thin jointing mortar provides strong bond between fly ash / clay bricks. Water resistant & good workability. Prepared for convenience in handling, mixing & application. Aquaproof Aqua Plast Classic is the modified acrylic base ready touse finishing putty for interiors in the paste form. Aqua Plast hasexcellent adhesion to the surface and provides quality walls andceilings for residential or commercial construction. · Aqua Plast in the paste form and does not require addition of water either for mixing or application. · Aqua Plast has a very high adhesive strength hence no need of a primer before applying Aqua Plast. · Aqua Plast finished surface has a very good flexibility, therefore no cracks or blisters. · Aqua Plast has superior workability, ensures ease of application for fast work execution. · Aqua Plast can be applied on almost all interior surfaces, new or old. Looking for Plaster & Putty ?